Oh my goddess. Where did Frozen come from? It didn't come from Hans Christian Andersen; this bears little resemblance to supposed inspiration The Snow Queen. It sprang from the grand Disney tradition of full-on, Broadway-style animated musicals. But unlike 2009's throwback The Princess and the Frog, which felt like nothing more than a tired retread, Frozen is — we can hope, anyway — the start of a new era for the wonderful little subgenre Disney has claimed for itself. 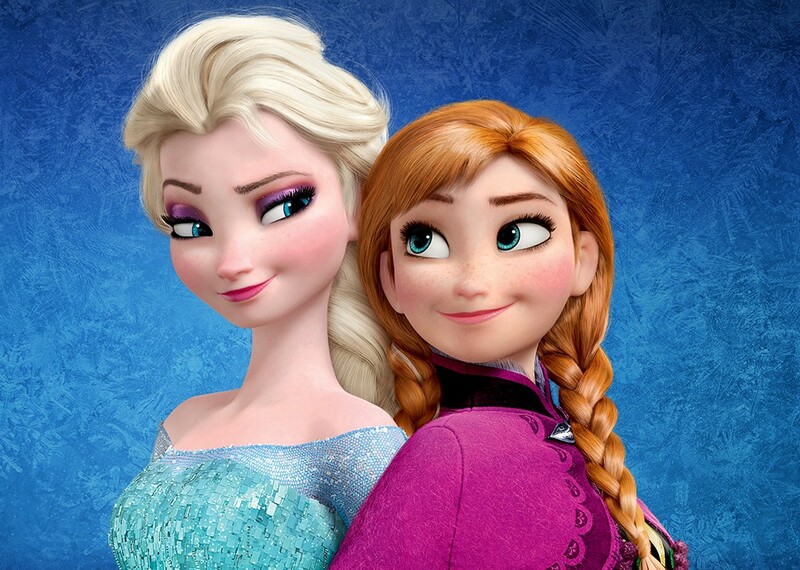 Frozen is a princess story; Disney is doubling down on the princesses — there's two of 'em here. But Disney is also doubling down on the hints of nascent feminism Brave hinted at, the sort of bare-bones feminism which accepts that girls and women might possibly want more out of life than to get married. The princesses are sisters — the elder Elsa (the voice of Idina Menzel) and the younger Anna (the voice of Kristen Bell) — and this is mostly the story of their troubled relationship. Which has nothing to do with jealously that arises over them both liking the same prince. When Elsa and Anna are small children, there's an accident: Elsa's paranormal ability to make things cold — a sort of Arctikinesis — knocks out Anna as they're playing in supernaturally produced snow, threatening the little girl's life. As part of the magical cure, Anna's memory of Elsa's ability is taken away — it's probably a good idea that they don't play like this again — and their parents, the king and queen of Arendelle, decide that Elsa should remain locked away lest she hurt anyone else; terrified of doing so, Elsa readily agrees. Fast-forward to the present, as Elsa comes of age and is about to be crowned queen (their parents died in a shipwreck). Anna has spent years not knowing why her beloved sister has shut her out; Elsa is desperately worried that her subjects will see her as a monster. The recipe for disaster is in place. The villains here? Unintended consequences, good intentions, and the pressures of conformity. When Elsa finally stops denying her Arctikinesis, she celebrates by creating a wondrous mountain ice castle for herself, belting out a glorious anthem to female power. Not since Howard Ashman's remarkably astute lyrics for Beauty and the Beast and The Little Mermaid — which are far more about a girl's longings to be her own person than they are about finding romance — has there been a Disney song like "Let It Go," as Elsa tosses away "the good girl" she "always [had] to be" and stops believing that "conceal, don't feel" is a healthy way to live. I had chills listening to this: someone gets it. (The lyrics are by Robert Lopez and Kristen Anderson-Lopez; they wrote the songs for Avenue Q.) Writers and directors Chris Buck and Jennifer Lee, with a screenplay assist from Shane Morris, get it. Disney is finally getting it. Hearing that you're not allowed to be yourself is stifling to a girl. Bottling yourself up is dangerous. In Elsa's case, literally and on a grand scale. She doesn't realize that, in her letting go of her inhibitions, she has accidentally covered all of Arendelle in ice and snow. In summertime. She didn't mean to do that. Anna doesn't know whether Elsa's actions were deliberate, but Anna is determined to find her sister and convince Elsa to fix everything... and to let Anna back in as friend and family. There are boy characters, too. There's handsome Prince Hans (the voice of Santino Fontana), whom Anna falls hard for. There's goofy ice merchant Kristoff (the voice of Jonathan Groff), who helps Anna on her journey. There's even talking snowman Olaf (the voice of Josh Gad), a byproduct of Elsa's magic; as comic-relief sidekicks go, he's one of the best Disney has come up with, and even gets one of the film's best songs. Frozen and Frozen 3D are not showing in any theaters in the area.